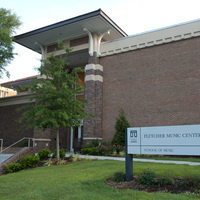 The A. J. Fletcher Music Center features two large rehearsal halls and a 260-seat recital hall. Within the center are electronic piano labs, five organs, more than fifty practice rooms, faculty studios, the Music Library, and the Center for Music Technology. The School of Music is located in the A. J. Fletcher Music Center. It is fully accredited by the National Association of Schools of Music (NASM) and the American Music Therapy Association (AMTA). Excellent musicianship and good choice of tunes. Would liked to have heard more of Devin, as the recital seemed to be the Sean Reeser recital. It was distracting to see the performers chewing gum, though.